BANGI, 31 July 2012 – A burger enterprise in Kajang, Mr Junior Enterprise, run by 11 students from the National Univerity of Malaysia (UKM) has won for them the championship at the 1 Malaysia Young Entrepreneur Challenge (1M-YEC) Convension earlier this month. They beat teams from Universiti Malaysia Terengganu (UMT), Universiti Putra Malaysia (UPM) and Universiti Malaysia Sabah (UMS) in the second category for public and private universities and won a trophy, medal and cash of RM7000. The students from the Faculties of Economics and Management, Law, Information Science and Technology, and Engineering and Built Environment had started the burger enterprise at Jalan Reko in Kajang for the past year. 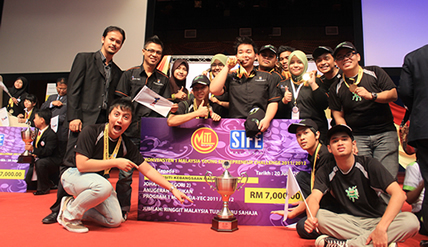 They are also members of the Student In Free Enterpise (SIFE UKM) club. A member of the team, Azmeer bin Nasri who is also the Deputy President Finance and Administration of SIFE UKM said it was a very good programme as it taught them to make quick decisions pertaining to their business. It has also given them the opportunity to nurture their business knowledge and train them to be better communicators. It had also enabled them to carry out into practise what they learnt about entrepreneurship and running a business in class. They had focussed the running of their business in five areas; marketing and sales, product, service, operation management and finance management. Their marketing was done through the distribution of flyers inserted in newspapers distributed to their target market, producing a Mr Junior video which they uploaded onto Youtube and taking part in UKM’s carnivals. During the course of the year they had improved upon their business period, placement of orders and deliveries while also improving the design of their delivery box and the use of sticker on the box. They are now improving upon their software to recod all their transactions. The convention held over three days at UiTM in Shah Alam ended on July 20 with the participation of 11 public and private universities. It was a pioneer programme of the Entrepreneurship Development Division of the Ministry of International Trade and Industry and the SIFE Foundation of Malaysia.